I’m always a sucker for those pretty tiered cakes…but man are they tough on the budget. And I haven’t quite perfected getting even layers just yet. I do, however love this pretty ruffled cake from Hackberry Adventures. 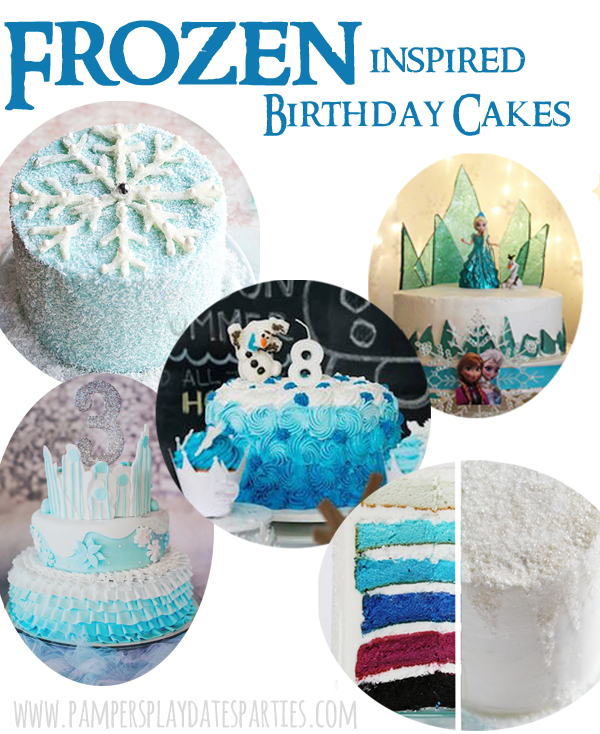 That ombre rosette cake from Uni Duni et T is too adorable with a fun Olaf topper, but probably still out of my skill set. (insert grumpy cat face here) I’ve seen a few versions of the cake with the ice palace made of sugar candy (this one found at Catch My Party). I bet it sparkles beautifully against the twinkle lights. The blue snowflake cake (from Cake Whiz) and multi-colored layer cake (from I Am Baker) are more my speed. I love the use of sprinkles on both cakes, and especially like the surprise colored layers underneath the white frosting. 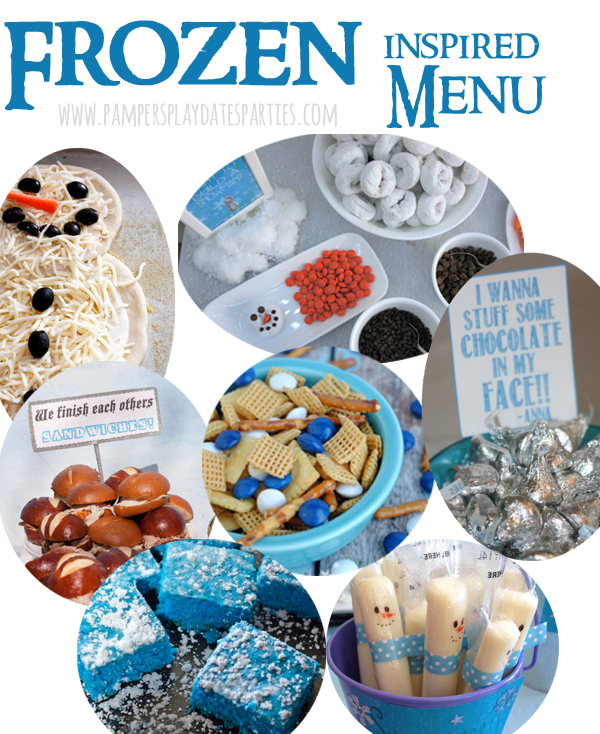 It seems there are tons of snowman inspired menu ideas…and how could there not be? There are many versions of the snowman cheese stick, though I like these from It’s So Very Cheri best. Kids always love pizza, so why not make one that looks like a snowman? (from Delia Creates) Though Little House on the Circle’s “Do You Wanna Build a Snowman?” bar with mini doughnuts, carrot pieces, raisins and chocolate chips is a creative take on the theme. The sandwiches (from Red Tricycle) and Hershey’s Kisses (from Living a Dream) with song lyrics are a fun way to add small touches. But if you want to keep it really easy, just make Everyday Savvy’s snack mix and these blue cake mix brownies as ice blocks (brownies found on Pinterest, but the original link never opened). Admittedly, my favorite part of planning a party is in the décor. Using sparkly trees like these from Elianna Noelle Events – perhaps adorned with crystal or glass beads is a fun and pretty touch. Layering twinkle lights behind sheer curtains (The Mom Tog Diaries) is also a fun and inexpensive way to add sparkle to the main event. Using silver frames like these found at (Kara’s Party Ideas) with a sugar layer is another simple and easy way to add style. 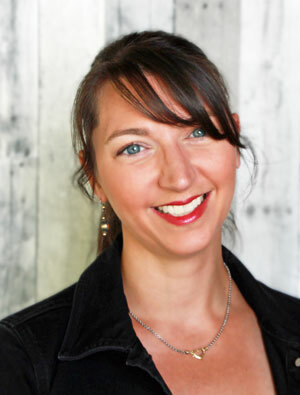 Places like Shutterfly, Costco and WalMart provide easy printing services for large scale images. 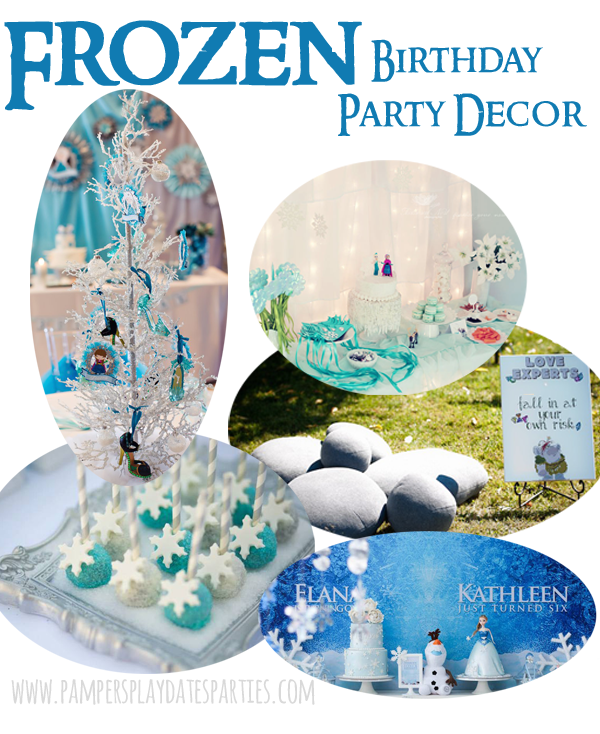 I love the backdrop from Kara’s Party Ideas that resembles the background to the Frozen DVD. Another simple way to add lots of impact. Though my favorite twist is the troll den from Karen Ayars Festas. I’m a big advocate of set-it-and-forget-it party activities, but one or two guided activities can make a party that much more fun. 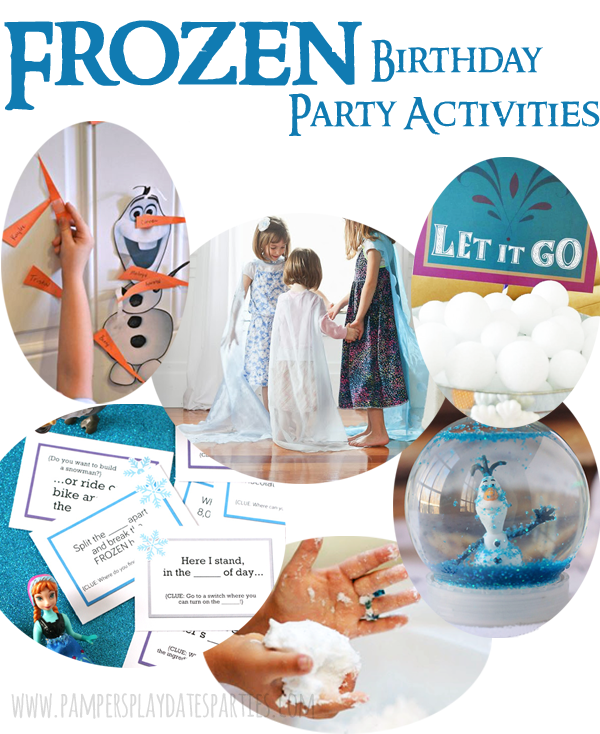 For super easy activities, you can have a snowball toss with styrofoam balls (found at Catch My Party), pin the nose on Olaf (from A Thrifty Mom), or an easy scavenger hunt (from Bombshell Bling – with printables!). For a bit more effort, you can make an indoor (or outdoor) snow sensory bucket (from Growing a Jeweled Rose) or assist kids in making their own Frozen snowglobes (A Million Moments). Though I will probably be coming back to this tutorial from Make it Love it on how to make a No-Sew Elsa cape that kids of all ages can help decorate themselves. If décor is my favorite part of a party…favors are my least favorite. So many favors are filled with useless junk. 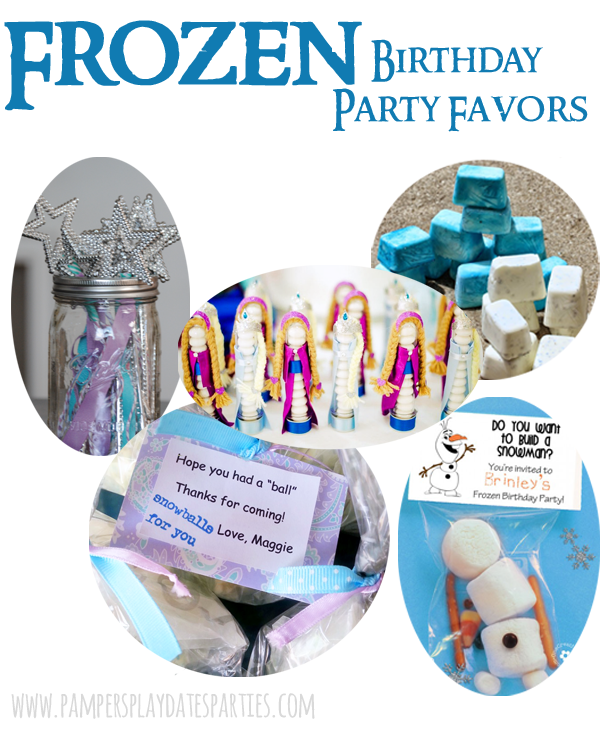 But I do like these ideas that are all super-duper cute: Anna and Elsa peg dolls as both party décor and favors (Marcela Castro Frescurinhas Personalizadas), ice chalk (Frogs, Snails and Puppydog Tails), build a snowman kits (One Creative Mommy), fairy wands (Fancy Little Things) and popcorn snowballs (The Foley Fam). 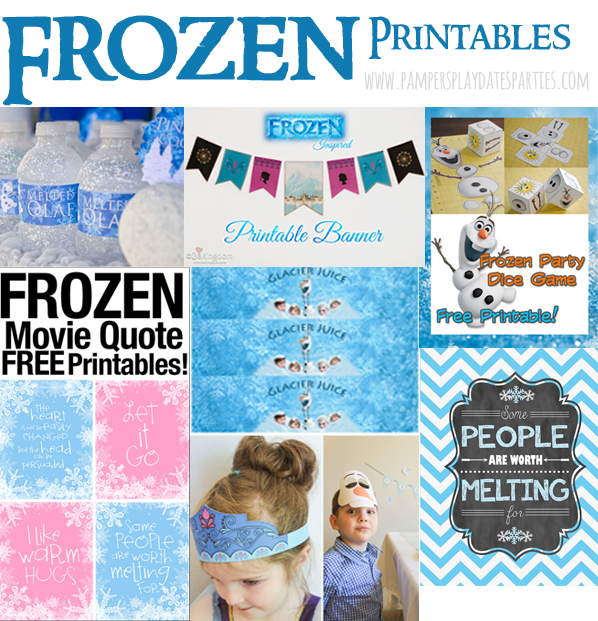 Are you tired of Frozen parties yet? 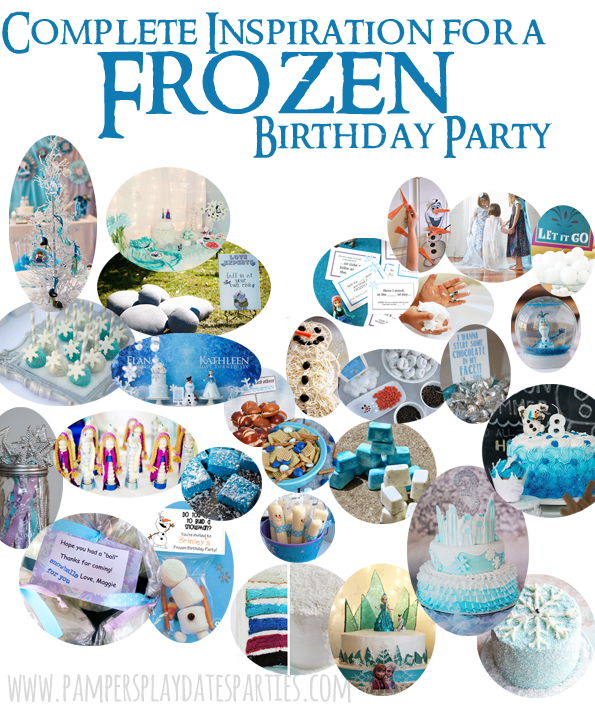 Where do you find inspiration for a party?